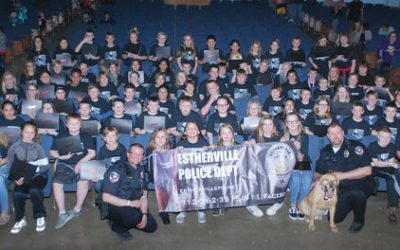 About 200 Tunkhannock Area Middle School fifth graders rose to the D.A.R.E. challenge on Friday by graduating from the 10-week course. 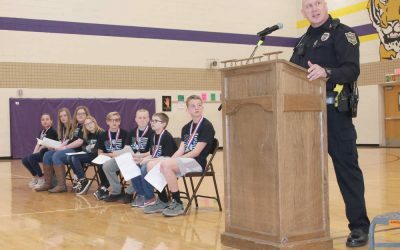 The Drug Awareness Resistance and Education program works to teach students how to meet a variety of life’s challenges – including resisting illicit drug and alcohol use; bullying; and developing good communication skills. Rich Seaberg, who oversees the program, congratulated the students on their accomplishment. “You are here to make a choice,” Seaberg explained. Seaberg thanked the Tunkhannock Rotary for providing $1,500 to help fund the program, Borough Police Chief Keith Carpenter, who was the guest speaker, plus Cammie Anderson of Wyoming County Drug and Alcohol. The event was attended by parents and grandparents of the graduating class. 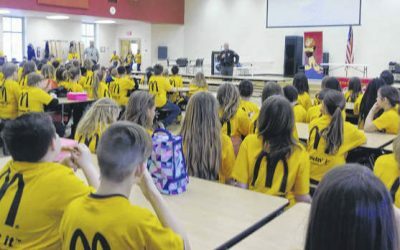 In his talk, Carpenter provided some statistics from the New York Times, indicating that of 200 students, 72 percent – 144 – will try drugs or alcohol before they graduate from high school. Anderson also spoke, saying that she and others have previously investigated why drug abuse is so rampant in teenagers. The answer, she said, is because many parents don’t discuss such matters with their children until they realize there is a problem. The best thing for parents and other family members to do is talk to children when they are younger, Anderson explained. 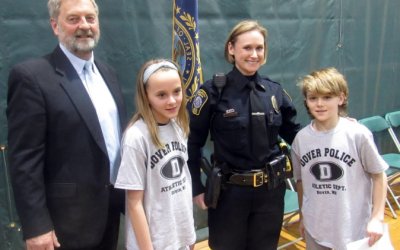 TAMS Principal Sue Bugno thanked older students Paul DeMarco, Sophie Burke, Leah Rome, Kailey Davies, RaeAnne Carpenter, and Saira Gamez who serve on the D.A.R.E. Mentor Program, as well as Kate Crispin who is the teacher administrator. 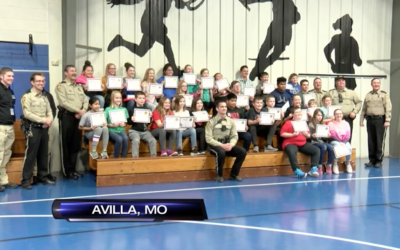 “I’m very proud of the D.A.R.E. 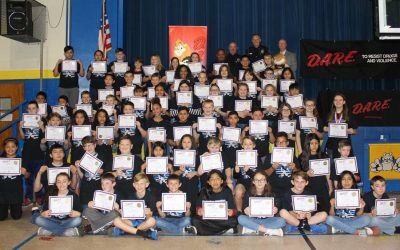 program, and I’m very proud of our D.A.R.E. graduates,” Bugno said. 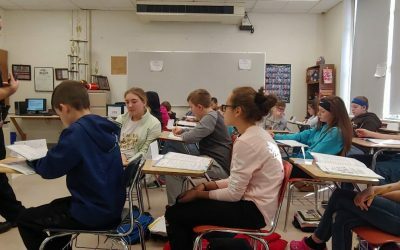 The students were required to write an essay as part of their graduation exercise. Fifth grader Ethan Dominick was awarded a $100 gift certificate from the Tunkhannock Rotary for writing the best essay. 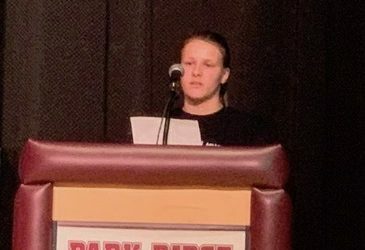 *“I want to say thank you to Mr. Seaberg, and all of the high schoolers who helped him, for teaching us the importance of staying away from drugs, alcohol and tobacco.” – Lauren Bulkley. *“The D.A.R.E.  Program has helped me learn some important facts about drug and alcohol use.” – Bow Garrett. *“I learned a lot from this, for just being a kid.” – Kayla Griffin. 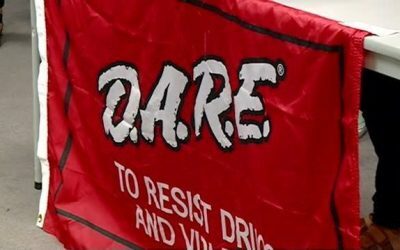 *“I learned a lot in D.A.R.E. class and what a big impact it has on our health and our community.” – Kelsey Parasky. *“We learned about walking away from conversations and choosing friends wisely.” – Jacob Walsh. *“Don’t ever let anyone pull you in or change your mind about drugs.” Karlee MacMillan.